LAST OF SIOUX AT TOMB OF LAST OF MOHICANS. General Belief That Red Man is Unemotional Disproved by Incident During Col. Cody's Visit to Norwich, Conn.
Chicago.—There exists among those who know of the Indian character only by reading fiction or by hearsay the impression that the Indian is stoical—that he never laughs or cries and that he is without tender sentiment. This is simply a misunderstanding of the Indian character. Fact is the Indian is particularly emotional, though he is not always particularly demonstrative in indications of what his heart feels. The impressions that the white man received of the red man while an invader of the latter's domains have been handed down to these generations ever exaggerated. Thus the word "Indian" has been a bugaboo to the children of many generations of America. Education and civilization, so far as they have reached the Indian, have brought to view the better side of the Indian among those of the east who have had an opportunity to observe it; his better side has been known to those who have become familiar with him in the far west. Col. William F. Cody ("Buffalo Bill") and his compatriots in blazing the western way have found it necessary to kill a great many Indians in battle and on the scout, but no man knows better the good side of the Indian than Col. Cody, and no one could be more eloquent than he in demonstrating it by words and treatment. With Col. Cody are many Indians of the truest type. Notwithstanding their travels all over North America and Europe with the aggregation named, these red men preserve their customs, costumes, character, and individuality to the last degree, and yet under the kind treatment that they receive at the hands of Col. Cody and his associates they are as kindly genial, good natured, laughing or crying or dignified a lot as occasion demands, as any other body of people that could be gathered from any source. These Indians appreciate a good story when they can understand it, and laugh as heartily at a joke that comes their way as anybody. They feel the loss of kin and their sympathies are deep, strong and true. A particularly interesting exhibition of the sympathetic nature of the Indian was brought about lately at Norwich, Conn., when they visited that city. About Norwich are many relics and mementoes of the war between the Narragansetts under Miantonomo and the Mohegans under Uncas, an Indian feud that has been dramatized in romances by James Fennimore Cooper in his powerful story, "The Last of the Mohicans" that has long been classic and standard. Among the mementos mentioned are monuments over the graves of Miantonomo and Uncas, who were deadly enemies, and Miantonomo was slain by a brother of Uncas after he had been captured by the latter, though the execution was pursuant to an order from white authority. Uncas was friendly to the white settlers. 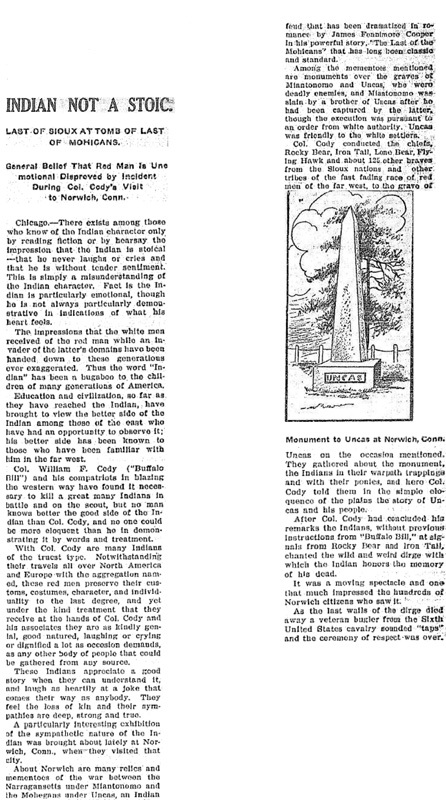 Col. Cody conducted the chiefs, Rocky Bear, Iron Tail, Lone Bear, Flying Hawk and about 125 other braves from the Sioux nations and other tribes of the fast fading race of red men of the far west, to the grave of [drawing] UNCAS Monument to Uncas at Norwich, Conn. Uncas on the occasion mentioned. They gathered about the monument, the Indians in their warpath trappings and with their ponies, and hero Col. Cody told them in the simple eloquence of the plains the story of Uncas and his people. After Col. Cody had concluded his remarks the Indians, without previous instructions from "Buffalo Bill," as signals from Rocky Bear and Iron Tail, chanted the wild and weird dirge with which the Indian honors the memory of his dead. It was a moving spectacle and one that much impressed the hundreds of Norwich citizens who saw it. As the last wails of the dirge died away a veteran bugler from the Sixth United States cavalry sounded "taps" and the ceremony of respect was over.